The other day I was reading Jeffrey Hamelman's recent book Bread: A Baker's Book of Techniques and Recipes when I came across his pretzel recipe. His recipe requires a pate fermente overnight, a long fermentation, and a bath in a solution of water and lye, which means rubber gloves and goggles are required. "Rubber gloves and goggles and caustic fluids to make a batch of pretzels?!? You've got to be kidding me," I thought. 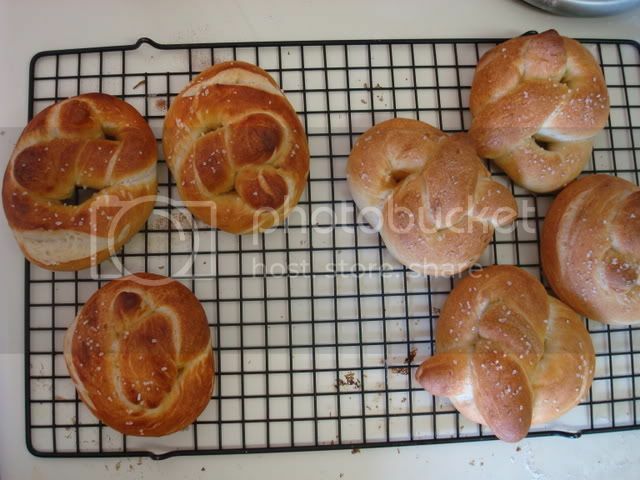 The next day I found myself flipping through another baking book when I stumbled across another pretzel recipe. No caustic bath. No preferment. Not even an initial fermentation: simply mix everything together, shape the pretzels, and bake them; beginning to end, under an hour. So which is it? Is it necessary to make the preferment and use lye to make decent pretzels at home? Do you even need to ferment the dough to make passable pretzels, or can you just jam them into the oven? By the way, the other baking book I was looking at was Breaking Bread with Father Dominic 2 . Not a bad little book. I gather that it is out of print, but if you see a cheap used copy at the local bookstore it might be worth picking up. I didn't follow his recipe exactly, but it provided a nice balance to Hamelman's recipe. There was no way I was going to try the lye bath at home. Maybe to make world class, authentic German pretzels that is necessary, but for a half dozen pretzels at home? Forget about it. I decided to try make pretzels with an initial fermentation and without. I also tried boiling them briefly in water, egg washing them, and just baking them dry. If any of those methods could produce something reasonably like the soft pretzels I've had before I'd be happy. I buy my yeast in a jar so that I can measure out as much or as little as I want (well, that and it is cheaper when you bake as often as I do). If you are using yeast from a packet, you can either use half a packet or double the recipe and use an entire packet (at least the packets they sell in the grocery stores in the US... international bakers will have to do their own conversion). If you are using instant (AKA Rapid Rise or Bread Machine) yeast, you can just mix the yeast in with the rest of the dry ingredients before adding the warm milk and it'll activate fine. If you are using active dry yeast, mix it into the warm milk along with the malt powder (or brown sugar) and give it 5 to 10 minutes to activate before incorporating it into the dry ingredients. Combine all of the ingredients in a bowl and mix together until it forms a ball. I start with 2 cups of the flour and mix it together until it forms something like a thick batter, then add more flour a handful at a time until it'll form a nice ball that I can knead by hand. Either use an electric mixer to mix the dough for 5 minutes or remove it from the bowl and knead it by hand for 5 to 10 minutes until the dough begins to get smooth and satiny. 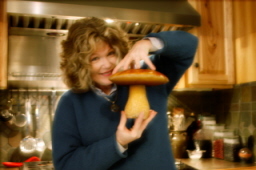 If you are going to ferment the dough (more information on whether this set is necessary below), return the ball of dough to a clean, greased bowl, cover with plastic wrap, and set it aside to rise until it has doubled in size, approximately an hour. If you fermented it, degas the dough gently before moving on to the next step. Before shaping, start preheating the oven to 425 degrees. Cut the dough into 6 pieces. 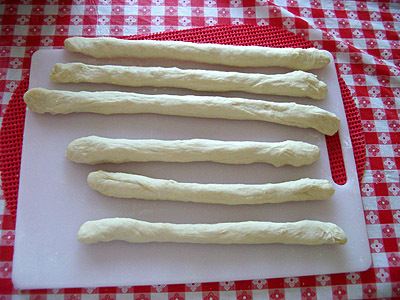 Roll each one into a short log, cover with a towel, and let the dough relax for 5 to 10 minutes. After it has relaxed you should be able to roll it out and stretch again fairly easily. After taking this photo, I let them relax again and then gave each a third roll and stretch session before they were as long and thin as I wanted (about 15 inches long and about as big around as my index finger). They'll nearly double in width while baking, so it is ok to roll them out quite thin. 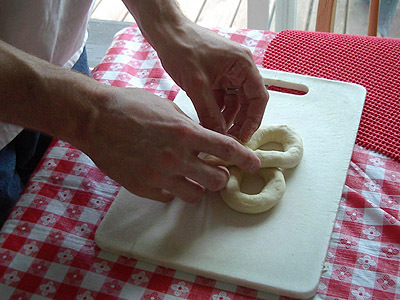 Shaping pretzels is simple, once you get a hang of it. Place a rope of dough on the work surface in front of you. Take each end in a hand, loop the dough away from you, and bring the ends back toward your stomach, crossing them about an inch above the rope. Apply a little bit of pressure to make the loops stick together, but not too much because you don't want then to flatten out. To boil them: If you want to boil them, bring a pot of water to a boil. Dunk each of the pretzels into the boiling water for 5 seconds, then place them onto a baking sheet and sprinkle with coarse salt (I use the kosher stuff that is easy to find at the grocery store) or other toppings. I used a pair of spatulas to hold the pretzel in place while holding it under water. To eggwash them: Simply place them on a baking sheet, brush them gently with an egg that has been whisked, then sprinkle with coarse salt or other toppings. To bake them (mostly) dry: Sprinkle or spritz them with a little bit of water so that the toppings will stick, then sprinkle with coarse salt or other toppings. Place the baking sheets into the oven. It took around 15 minutes for my pretzels to get golden and brown. Remove from the oven and eat immediately. We definitely thought the boiled pretzels (on the left) were better than the pretzels that had just been spritzed with water (on the right). The spritzed ones were dry and had a slightly french bread like crust. Crust like that is good on french bread but not so good on soft pretzels. I liked the boiled pretzels more than the eggwashed pretzels, my wife preferred the eggwashed pretzels better. The eggwashed ones rose considerably more in the oven than the boiled ones, so they were quite soft and fluffy. The boiled ones were still soft, but they were a little denser and chewier. Truthfully, I couldn't tell the difference between the batch that I let ferment for an hour and the batch I baked immediately. If I were tasting them side by side with no toppings I probably could detect a slight difference. But at least when I eat soft pretzels they are a medium for other flavors (salt and mustard), either method produces an adequate pretzel. And the lye bath? At least for the home baker I can say with confidence that you can skip it. Defender of the lye bath? Or have any other insight into proper pretzel making? Please comment! I completely agree with your assessment on the necessity of a lye bath. It's unnecessary for the home pretzel baker. In fact, I called my cousin, who owns an Auntie Annes Pretzel Store and she said that she'd heard about lye-baths for pretzels, but always considered it a very old-world, hard pretzel tradition. 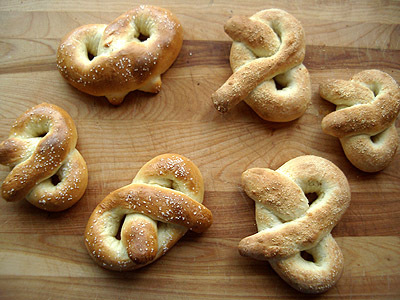 I've made countless pretzels using a recipe similar to the one here. And, like you, I've found that boiling them first gives them a significant edge over dry baking. :) I used to egg wash mine, but I gave it up when the kids couldn't notice a difference. I found the fermentation was helpful; not so much for taste, but in my small kitchen it gave me time to clean and prep for the shaping. I have to admit, when I spent a couple of weeks in Koln a few years back I ate a ton of bread (mostly rolls), but I never got around to trying pretzels there. Without the lye bath the pretzels come out like the soft pretzels that are commonly found in the States at places like baseball games, but I bet they are a lot different than authentic German pretzels. I added a link to your blog to the link section. I remember looking at it when you first joined this site... you bake some beautiful stuff! They diffinately take priority over the lye... save the skin peel for the cosmetic surgeons. Any ideas on why my pretzels stuck to the pan? I'd use a sheet of parchment, lightly dusted with white flour or corn flour, to eliminate the sticking problem. This recipe rocks!! I just made a batch and it's so easy and so so deliclous!! I boiled mine in water with a teaspoon of baking soda. Thank you so much for sharing this recipe!! How does one dispose of a lye bath ... is it safe for the plumbing to flush this down the toilet or sink ? I'd like to try a cold, food grade lye batch but I don't want to store the solution in the house. I've been making pretzels lately and note that some descriptions talk about holding the dough between two spatulas in the boiling water bath. (I use baking soda 1T per cup of water). I use a simple French bread type dough recipe and the second rise makes them puffy enough to float and still firm enough to use tongs for handling. I experimented with a tomato-herb pizza dough that I had frozen and found that although the pretzels were okay, they did not float and were kind of gloopy to handle. Point being, using the right dough makes it easy and fun. I tried making pretzels once....what a disaster. How stiff does the dough have to be? and how do you keep them from turning noodly? Here's my experience (I am a very very novice baker) with this recipe. I feel that I must add my 2 cents to this heated lye debate. I haven't made pretzels either with or without lye, but I do know a thing or two about lye itself. Way up near the top someone asked wether lye was Sodium Hydroxide or Potassium Hydroxide. I must tell you that it is both. Sodium Hydroxide is a relatively new type (within the last 150 years or so) that is distilled out of sea water - hence the sodium. Potassium Hydroxide is the old-timey kind that is leached out of ashes. As a soap maker, I have used sodium hydroxide (Red Devil lye). For soap making, it is used in much higher strengths that for boiling a pretzel, I'm sure. If splashed on clothing, it may leave a bleashed spot or a hole. If splashed on the skin, rinse thoroughly with cold water immediately and you'll be fine. After making soap in an iron pot over an open fire at an 18th century Fort for a summer, believe me - it won't kill you. Even without gloves and goggles. I was constantly splashed with raw soap... At one point I cleaned out my iron pot with bare hands. NO- it wasn't my brightest idea. YES- It stung, quite a bit. YES- I figured out a better way to do it in the future. NO-I didn't lose any of my skin. That being said, I agree with every other poster - DON'T GET IT IN YOUR EYES!! Also - about wether lye 'deactivates' in the oven. The reason that no one has singed their skin off with real lye soap is because the chemical does evaporate over time. That time is shortened with heating. Soap that is boiled before pouring will be ready to use almost immediately after hardening. Soap that is not boiled will need to cure for about 6 weeks. That being said, dipping your pretzel into already boiling lye water and then baking it, should be more than sufficient at remove any traces of the lye from your food. I also think that "food grade" lye may be a bit of a stretch. 100% lye is 100% lye... if there are and dangerous additives, it can't be listed as 100%. I hope this has been helpful in the way of a lye explanation, to alleviate a few fears and myths. Now - I just have to try the pretzel recipe so I can decide which way I like them better!! I couldn't wait after re-reading the posts, so I jumped right into pretzel making. If you've read all the way down these posts to mine, you must be pretty interested in pretzel making, so I'll share the details. I decided to make 3 kinds - Plain, Cheddar and Dessert - 2 of each. After I proofed the dough for an hour, I divided it into 6 pieces. 4 I rolled into long snakes, and 2 I kneaded together with 1.5 t. cinnamon. (it took a while, but it all went in - ended up streaky like cinnamon swirl bread!) Then I cut the cinnamon dough into 2 and rolled those as well. By that time, the first 4 were ready to be rolled and stretched again. When they were all 15" long and the size of my finger, I followed someone's idea and split the cinnamon and 2 of the plain rolls open longways with a serraded knife. The dough was a perfect consistancy, and opened nicely, without sticking. To my surprise, they were a little bit hollow - perfect! For the dessert pretzels, I filled the cavity with brown sugar. For the cheese ones, I took 3/8" x 3/8" strips of very mature, strong cheddar, broke them into short pieces, and pushed them into the crack. For both kinds, I wet the edges of the dough before sealing. Then, I pinched up a high ridge, wet the whole ridge, and folded it over to seal it down to the dough, rolling it seam-side-down for a bit to ensure a good seal. I formed all into pretzels as instructed. I didn't happen to have any lye available, so I used the "1 qt. water with 4 T soda" approach for the boiling. I boiled them for about 30 seconds on each side, then removed to a cooling rack and immediately sprinkled with salt while still slimy. I boiled the cinnamon ones last in case the cinnamon got into the water (which it did) and did not sprinkle those with salt. By the time they were all done, they were actually firm enough to pick up and place on my pre-heated baking stone. I removed the stone from the oven, placed all pretzels on, then put it back. In my convection oven, they only took 7 minutes. The cinnamon ones were immediately removed to a cooling rack and brushed with my dessert topping - 1T butter melted with 1T brown sugar. Both the sugar and the cheese boiled out some, but I didn't lose much. The dessert ones tasted very nearly like my homemade cinnamon rolls - and were a lot less work!! Next time I plan to toss raisins with the brown sugar, then stuff the rope with teh raisins. My husband nearly lost his power of speach when he bit into a cheddar one. All I got was "Oh... wow..." And then the pretzel was gone. Anyone who's ever made bread with chunks of cheese in it knows what happened. When cheese cools inside bread, it clings to the bread, leaving a hollow place in the middle. They were outstanding! We are too stuffed to try the plain ones, but from tasting the dough of the cheese ones, I can tell you that they will be awesome. The outside of the pretzels was firm and chewy - the indide soft and tender. My husband declared that this recipe was "a keeper", and I will continue experiment with fillings - Sooooooooo good! How much baking soda did you use? I typically do 1/3 cup for every 5 cups of water (that's a lot) in my bath and it works well. Also, is the baking soda fairly new? I don't think lye does anything to make the crust taste a certain way. It's supposed to gelatinize the outside and help give it that shiny brown appearance. Wow, I never knew Auntie Annes used cold baking soda. No wonder they don't taste like German pretzels. NaOH reacts with the carbon dioxide (CO2) in the oven to form sodium carbonate, NOT sodium bicarbonate (baking soda). So there should be no NaOH left on the pretzel. Food grade (FCC) lye would be analyzed for trace amounts of nasty stuff, like heavy metals or PCBs (or melamin) that you don't want to eat. There are recipes calling for 100 grams of sodium carbonate in 3 liters of boiling water and I'd like to try that. I tried the lye bath and it is essential for German-tasting pretzels. Afterwards, I diluted the lye with vinegar and poured it down the drain with plenty of water. That being said, it's perfectly alright to make pretzels with any dough and in any manner you wish. Pretzel refers to the shape. 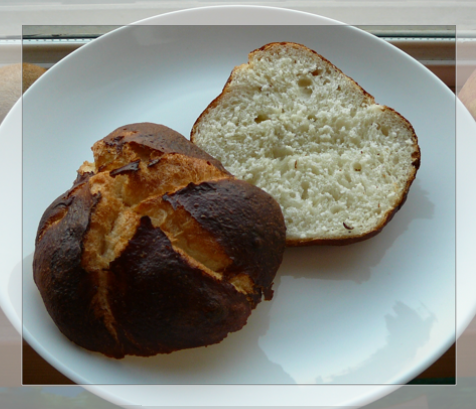 "Laugenbrezel" refers to salty dough dipped in lye and sprinkled with salt. I have eaten soft pretzle's in Philly, and on streets of NYC for years upon years as well as real Deutch Brau, Bier Halls in Queens, (they had the SS party song and Altercammarade,(Luftwaffer theme song) in the juke box I kid you not). I am very much American, of Eyetalian descent, this place was very deutche, the owners were a recent import. The food was authentic. The pretzles were mahogany, and the ryes were superb. 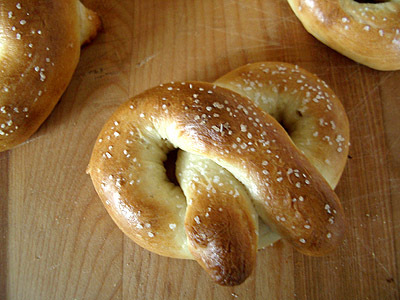 Pretzles need lye, period. You can make due with soda , but color and mouthfeel suffer, as well as a tiny part of the taste. Ever notice how if you wet a hard pretzle with your tougnge if it slides on your lips it is slippery soapy even. That is due to the reaction of a relatively strong base with the flour, lower potency caustic, makes less of impact on the pretzle skin. Causic plus liquid fat and heat make soap that is called saponification. Homemade diesel fuel (yep it can be done)from deep fryer/whatever fat, is made by keeping the temp at a certain level with water and lye, then it "cooks" for an hour , then it separates and is rinsed out , water, glycerin and oil separate, the rinsing removes residue. Your homebrewed diesel, or home heating oil(same stuff actually), may smell like french fries or whatevr was fried, but cleaning helps. We were taught this the first day of biolab when I was in freshman year of HS. We used powerful reagents (acids/bases(caustic)), there were eyewashinh stations in the lab. from the time a caustic hit you, you have six seconds to wash it off. The eyes get less then six. MY lab teacher then made a mistake and burned himself on both arms and his face, just a bit, but he was reddened after smearing what looked like water but was a diluted acid solution splattered on the soapstone lab tables. BUT I have a question, and request, when telling peo0ple to use malt, please tell us if it is DIASTIC MALT or SWEET make a "malted milk". The Reinhart book on whole grain breads explains a lot but knowing what your recipe wants is a good first step. Also I have a malt syrup that is meant to put in milk, so what kind of syrup is needed? Is my malt syrup crap, or real who can tell? So if you have a brand, please tell me/us. Things are not what they were 40 years ago. If you ask for a malted today, you will get a milk shake unless you are in the right place. My kids heard the term malted and requested one, I made them one, they gagged. Over a few years they relaxed and educated their palletes, malted are now de riguer, when dad is in the generous mood to make them. And they want me , not the wife to make them, cause I make them very thick ,very malted and very very very chocolatey, else, what's the point. The reason I bake breads are because the general use of crap in food, (not talking "healthfood") is staggering food is getting inedible, tasteless, homogonised to the point of wax. They put seaweed and mono-diglcerides in heavy cream now, they started doing that about 10 years ago. If you are lucky were you live they do not, but, in most stores from NYC to Boston, pick up a container of heavy cream, look at the ingredients, you will find cream, milk, Mono diglceride, carregean(sea weed extrcts to make pudding). The sea weed may even be natural, but when I want make a batch of good sour cream/creme fraishe/mascapone, I now MUST go to healthfood store, where they sell me raw dairy, at a huge cost. This is insane. This easily one of the top 5 sites on the net. I appologise for the rant at the end, look at a container of cream, or a loaf of bread, read the labels. So, the verdict here seems to be that dipping in lye is good, but at least dipping in baking soda makes a big difference. One thing I didn't see in this thread is any consensus on whether to dip the preztels in a cold lye/baking soda bath, or a boiling one. 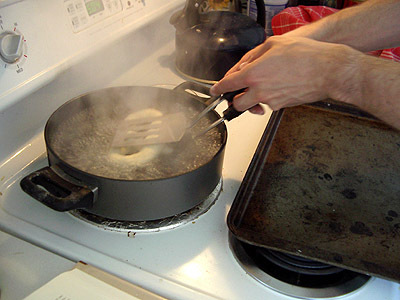 The original post has dipping in plain water or boiling in plain water, and several people have recommended boiling here, and some cold water. Hamelman's formula calls for a cold lye bath, I know. Anyway, I did an experiment. I made the recipe from Hamelman's book, with the preferment and fermentation time, and used a baking soda solution, 2 tbs in 2 cups water, as others have suggested. 'Proper' German pretzels (Brezeln) are boiled briefly in a solution of NaOH—Sodium Hydroxide—also known as Caustic Soda. It has a bitter taste, but will NOT cause any bitterness to bagels or pretzels. 'Baking soda' and even 'washing soda' are only about as caustic ['alkaline'] as seawater...you wouldn't need 'chemical spill goggles' and rubber gloves to boil dough in seawater, would you? However, if you DO use caustic, please make sure you use ONLY glass or stainless steel. Black, cast-iron dutch ovens have a "seasoned' surface that will almost certainly create soap, which won't help the flavor of your pretzels at all. The same goes for any other cooking oil or fat that adheres to your cooking pots. IMPORTANT: Please *STRICTLY AVOID ALUMINUM* (and most other metals) even if coated with Teflon®, etc! I think that you probably used old yeast or killed it. Check the date. Just try the recipe again. 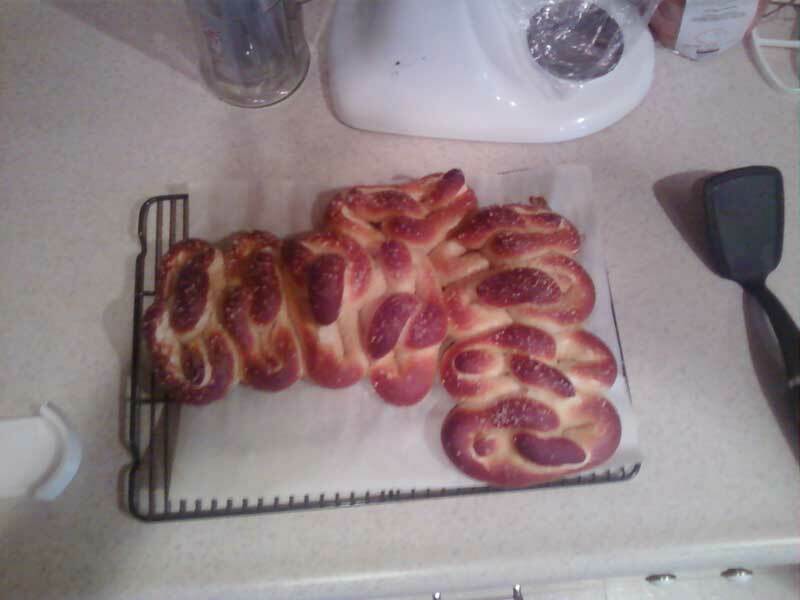 I've had good results with Lina Kulchinsky's Sigmund Pretzelshop recipe that's posted on Martha Stewart. No lye. Great slight chewy texture with excellent flavor. Only would add less salt. Just do an online search and you'll find this recipe. Good luck. Growing up in Philadelphia I have yet to find a good replacement for true Philadelphis Pretzels. I am close to what I consider a Good pretzel. And I do use a lye bath. Baking Soda Boil is just not the same. It is hot here in Nevada so I make these outside on the grill keeps the kitchen cooler. I make the dough a day ot two ahead. Then Roll, Rise boil and bake. As if this thread was long enough it hasn't said it all about pretzels. Ok, I got a 50% hydration dough and I did it all different. I combined almost all the flour and all the water and let the just blended dough rest overnight in a small covered container. Next day I added the rest... dissolved yeast with egg white, salt and brown sugar (wished for malt) and last but not least worked in the rest flour and oil. Wondered if I'd have trouble blending but it kneaded into a nice smooth dough. I was impressed. Now the soda bath is cold. Mixed as much into it as I could and had soda crystals on the bottom of the plastic box. After shaping the pretzels and knots, I threw them into the cold soda water to proof half an hour turning and splashing them around and rolling them over for a good soaking. Removed and placed on parchment. Heated up the oven and in they went. Not bad, in fact good! Very dark chestnut brown crispy caramelized crust and soft fine white crumb. 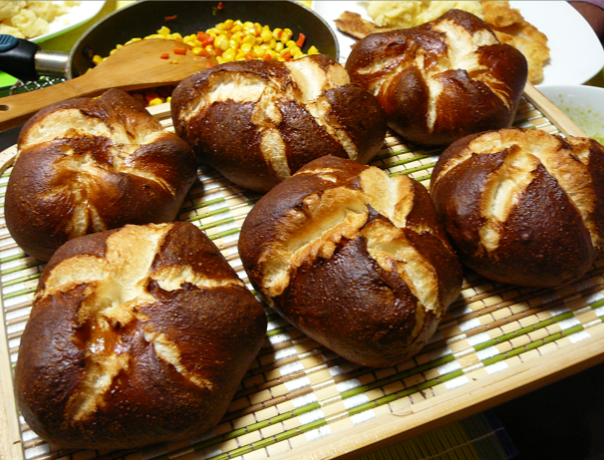 They are soft rolls with unmistakable pretzel taste. It was a hard roll recipe and interesting to compare the bakes as I split the dough. The unsoaked hard rolls could take more heat in the oven. The soaked rolls browned much faster and I turned down the heat quickly... almost thought they were underbaked until I cut them open. The taste is not as strong as Lye but pretty darn close and they didn't dissolve in the cold bath. Pretzel rolls, have fun... easy! ...and the boys love 'em! Same recipe as above: 50% hydration kaiser roll dough, Nov 10,2010. I don't know if to call them soft pretzels or kaiser pretzel rolls. You judge for yourself. The oven was too hot at 210°C so I reduced it to 200°C steam. They browned so fast it was scary! Great oven spring! Total baking time about 15 minutes rotating the pans at 7 minutes releasing steam. 100g dough in each. Crispy crust, Soft white tender bread inside. Your rolls remind me of them: dark on the outside, light and tender inside with just the right amount of maltiness... Yum! Hubby wanted pretzels. Dark on the outside & krispy middles. So, when cutting dough to shape, I cut little 20g dough pieces and rolled them into little snakes about 5 inches long and tossed them into the soda solution and stirred gently with a chop stick, often, about 10 at a time. After they floated to the top, 5-10 minutes, I removed them one by one and stretched their slimy little forms into long strands of pretzel dough between my fingers. This soaking makes it very easy to make long strands. Very elastic little worms! 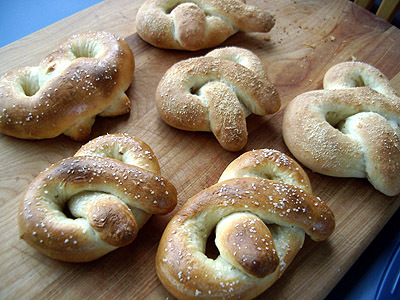 Did some of those cute twisting actions seen on many videos and laid my Bretzels on parchment to rise in a plastic bag. After a 10 min. rest, I stretched the shapes some more. Sprinkled with salt when I thought them puffy enough (they were also so relaxed I thought I had liquid dough) baking pre-heated at 200°C Steam first 4 minutes brings them well rounded forms. Dry bake (180°C) another 5 minutes and turn each upside-down to dry out the bottom sides. Remove when crispy and before they get too dark. They didn't last longer than 10 minutes. I used barley malt syrup and baking soda in my boiling water and I had some beautiful coloring on my pretzels. Next time I will use lye, as soon as I can find it here in remote Australia ( I am an American Expat). My husband is from Augsberg , and enjoyed these! Those look amazing! Can you share your recipe? Can anyone help with lye bath questions? Bought lye and made a batch - delicious! People, I was really troubled with the 'should I buy and use lye?' question. After some internal debate, I wanted to know what it really could do for my baking. So, I went for it and am never going back. Lye all the way. Watch some youtube videos and you'll learn about safe handling and proper use. I love good pretzels like the rest of us but for some reason the idea of putting something into my body that was soaked in a substance used to clean drains seems insane. It is not like you are eating the lye.Baking the lye changes the properties, which is why you don't see your skin peeling off after you eat the pretzel, and they only wear gloves when dipping the pretzel but not when eating it. I just made these following the recipe above, more or less. I cut the dough into 16 pieces and rolled it out to about the width of my pinky finger. Just before putting them in the oven, i dipped them in a bath of 1 liter boiling water with 60 grams baking soda. I gave them each about 4 or 5 seconds and then flipped them over and gave it another 4 or 5 seconds.